I am Interested, What's My Next Step? 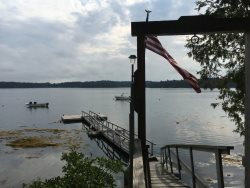 Gorgeous recently updated house sitting right on the oceanside on Quahog Bay! Concierge Services are NOW available! Is there something else you would like to see offered? Don't hesitate to ask us! If we can do it, we will! Who doesn't love a good old fashioned shore dinner? Who doesn't love local roasted coffee & fun new mugs! had their baked goods you are missing out! if you didn't live near the ocean! Sand Pail, Shovel, Sand Molds, Wiffle Ball & Bat, and more! by delivering it right to your rental. We know it can be hard to pack everything in the car, or even more difficult while flying, and sometimes a rental doesn’t have some of these items. Please call our office or login to your LiveStay App to add any of the following rental items. Visit one of these businesses to fill any additional vacation needs! We want to make sure that you are as comfortable as possible during your stay. Because of this commitment we are constantly adding or changing the services that we provide. Please contact our office for more information or to place an order. If there is something you don’t see offered but it is something that would like please don’t hesitate to ask, if we can make it happen, we will! ALL CONCIERGE AND RENTAL ITEMS ARE AVAILABLE ON A FIRST COME FIRST SERVE BASIS. IMAGES ON THIS PAGE ARE NOT NECESSARILY THE EXACT ITEM, BUT A VERY SIMILAR REPRESENTATION. BREAKFAST PACKAGE WILL BE DELIVERED THE PRIOR AFTERNOON, IF YOU ARE WANTING BREAKFAST DELIVERED ON A MONDAY THE DROP OFF WILL BE THE PRIOR SATURDAY. LOBSTER LOVERS PACKAGE IS ONLY AVAILABLE ON THE FOLLOWING DAYS SATURDAY, TUESDAY AND THURSDAY.